People who snore may not realize that annoying sound might signal a more serious issue—sleep apnea. Sleep apnea occurs when breathing is obstructed while you’re sleeping. Your breathing actually pauses repeatedly for short periods of time throughout the night, forcing your body to repeatedly wake up to restore it. There are two different types of sleep apnea. Central sleep apnea is neurological in nature; the brain fails to send the signal that regulates steady breathing while a person is asleep. The second type is called obstructive sleep apnea, or OSA. This is the more common type, and it is caused by the relaxation of the soft tissues in your mouth and throat, including your tongue. While relaxed, this tissue may fall back and block your airway. Sleep apnea’s most common symptoms include chronic daytime fatigue, frequent waking, and of course, snoring. In addition, many people also may experience a morning headache or sore throat, moodiness, irritability, depression, and difficulty concentrating. What Are the Consequences of Sleep Apnea? Unfortunately, sleep apnea can exacerbate or even lead to a number of serious health issues. Researchers have found a link between OSA and high blood pressure and heart disease. Why? Because without enough oxygen in your blood, your heart must work harder and pump more blood in order to deliver an adequate supply of oxygen to your body. As a consequence, the blood pressure rises and heart disease may ensue. Other diseases associated with sleep apnea include diabetes and stroke. In addition, the daytime sleepiness that is common for OSA may increase your likelihood of falling asleep while driving. In fact, people with sleep apnea are 5X more likely to be involved in auto accidents than people who sleep normally. In Ann Arbor, sleep apnea therapy provided by Dr. Olsen involves a custom oral appliance that will create space in your mouth and allow you to breathe easily during sleep once again. Called a nightguard, this comfortable oral appliance shifts your lower jaw forward slightly in order to prevent your tongue and the soft tissues in your throat from obstructing your airway. 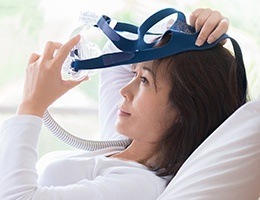 For many people with sleep apnea, this appliance proves to be much easier to use than a CPAP machine. Want to once again get a good night’s sleep? Does your spouse complain about your snoring? Do you worry that your sleep apnea may lead to more serious health problems? With sleep apnea treatment in Ann Arbor, Dr. Olsen can reduce snoring annoyance, improve the quality of your sleep, and help prevent health issues associated with sleep apnea. To start getting the rest you deserve, contact us today.